Corbin Jacket Maker Kits produce bullet jackets from tubing, from copper strip, or from fired cartridge cases such as .22LR jackets. These are also shown under individual type categories such as the -R, -S, and -H dies. 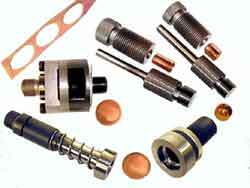 Tubing jacket makers use precision seamless tubing to make fairly heavy walled hunting bullets at minimum tooling cost. Copper strip jacket makers offer more versatility in control of the wall thickness, taper and wider variety of calibers (anything from 0.102 to 25mm is possible). For highest precision, and for thinner, higher expansion jackets, strip jacket makers are the choice. For lowest material cost, recycled cartridge cases are a good choice. Some make excellent quality bullets (such as the .224s made from fired .22LR cases) and some make only acceptable survival quality bullets (fired 9mm cases to 308 rifle bullets). All offer an alternative to commercial jackets, which may or may not always be available.